One of the best ways to store bumper plates, dumbbells, kettlebells, or medicine balls. This 45" 2-Tier Mass Storage System comes with two shelves meant to hold up to 42" worth of bumper plates and the ability to add-on a dumbbell or kettlebell shelf wherever you please! - Includes (4) 45" Uprights that can be bolted down to the floor. 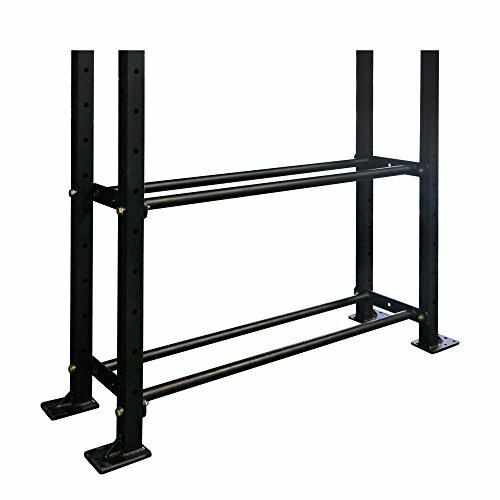 - Includes 2 shelves you can place at multiple heights to customize your rack for medicine ball and bumper plate storage. - Dumbbell and Kettlebell Tray Add-On's allow you to store your most used equipment at your own custom desired height. - Angled Braces reinforce frame to allow for extra weight capacity. - Outside Upright to Upright Depth: 14"
- Inside Upright to Upright Depth: 10"
Includes (4) 45" Uprights that can be bolted down to the floor. Includes 2 shelves you can place at multiple heights to customize your rack for medicine ball and bumper plate storage. Dumbbell and Kettlebell Tray Add-On's allow you to store your most used equipment at your own custom desired height. Angled Braces reinforce frame to allow for extra weight capacity.